29. The Royal Instructions are such that the Indigenous Peoples, any of them and all of them, are not to be molested or disturbed in any manner. This is evidenced in the Royal Proclamation (1763) and confirmed in s. 25(a) of the Canadian Charter of Rights and Freedoms (1982). The compelling of the Applicant to appear in one of Her Majesty’s Courts operates in a manner that tends to molest the Applicant. As well as molesting the Applicant, this compulsion directly acts to further the genocide on the Indigenous Peoples as a whole. The secondary Trustees have chosen to employ genocide in every manner in order to not have to pay the annuities and or augmented annuities. the furtherance of the genocide the Federal Governing structure is determined to exact and is exacting on the Indigenous Peoples. The Indian Acts are the corpus delicti. Any time the Federal Governing structure wanted certain lands or other concessions the Indigenous Peoples would not or could not give up, the Federal Governing structure enacted “legislation” to take those lands away. 31. The Applicant, Beneficiary estimates the time required for argument of no more than half a day. 32. Such further and other evidence and documents, as may be submitted and which may be accepted by this Honourable Court. 33. In support of this application the affidavit of the Applicant will be read and such further and other material as the Applicant may advise. A.) An order that forced appearance of the Applicant a Beneficiary and Signatory to a court of a subordinate Governing structure, a Trustee to the aforementioned Beneficiary and Signatory is a breach of s. 25(A) of the Canadian Charter of Rights and Freedoms (1982). B.) An order that the forced appearance of the Applicant a Beneficiary and Signatory to a court of an Alien Governing structure, a Trustee to the aforementioned Beneficiary and Signatory is a breach of the contract of ratification, dated the 2nd day of April, 1879. C.) An order that the forced appearance of the Applicant a Beneficiary and Signatory to a court of an Alien Governing structure, a Trustee to the aforementioned Beneficiary and Signatory is a breach of the Trust made by adhesion, on the 18th day of September, 1878, by actions of the secondary Trustee (Her Majesty’s Loyal sworn subordinate Officer(s)) and is in dereliction of sworn duty to Her Majesty committing acts of conspired treason against Her Majesty. D.) An order that, the Applicant a Beneficiary and Signatory is protected by the contract of ratification dated the 2nd day of April, 1879 and not subject under an Alien Jurisdiction of the Federal, Provincial or Municipal Governing structures as titled (secondary Trustees). E.) An order that, the Applicant a Beneficiary and Signatory is protected under the trust made by adhesion dated the 18th day of September 1878 and is not subject under an Alien Jurisdiction of the Federal, Provincial or Municipal Governing structures as titled (secondary Trustees). F.) An order that the Royal Proclamation (1763) protects the Applicant a Beneficiary and Signatory to the Trust and any and all of the separate and distinct Indigenous Peoples referred to as NATIONS AND TRIBES OF NORTH AMERICA INDIANS, and are not subject under an Alien jurisdiction of the Federal, Provincial or Municipal Governing structures as titled (secondary Trustees). G.) An order that Her Majesty’s Order(s) dated the 28th day of June, 1985, protects the Applicant a Beneficiary and Signatory to the Trust and any and all of the separate and distinct Indigenous Peoples referred to as NATIONS AND TRIBES OF NORTH AMERICA INDIANS, are no longer held under the usurped subject matter jurisdiction of the scheme of enfranchisement and its provisions by the secondary Trustees (Her Majesty’s Loyal sworn subordinate Officer(s)) and are not subject under an Alien jurisdiction of the Federal, Provincial or Municipal Governing structures as titled (secondary Trustees). H.) An order that Geo. III, c.138 1803 protects any and all of the separate and distinct Indigenous Peoples referred to as NATIONS AND TRIBES OF NORTH AMERICA INDIANS, the Applicant a Beneficiary and Signatory and any Beneficiaries to the Trusts and are not subject under an Alien jurisdiction of the Federal, Provincial or Municipal Governing structures as titled (secondary Trustees). I.) An order that a Trustee has no discretion, upon any pretence, by action to molest or harm the Applicant, a Beneficiary and Signatory to the Trust. J.) An order that the commanding of the Applicant, Beneficiary and Signatory to the Trust to appear under duress under any Alien jurisdiction constitutes a form of genocide. 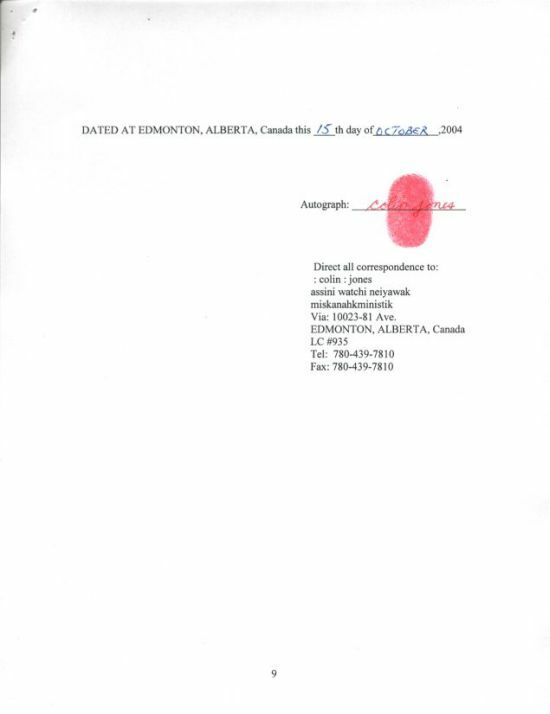 K.) An order that the titled ATTORNRY GENERAL OF CANADA or assignee (Trustee) withdraw the charges against the Applicant, a Beneficiary and Signatory to the Trust. L.) An order that the Applicant is a Beneficiary and Signatory to the Trust and not under the subject matter jurisdiction of the Monarch (Trustee) or under the subject matter jurisdiction of the Federal, Provincial or Municipal Governing structures as titled (secondary Trustees).